If you've ever taken a memory image of a Linux virtual machine that's running under XEN in paravirtualization mode and you've tried to analyze it you'll have noticed most of your plugins don't work (if any). ERROR:rekall.1:No profiles match this image. Try specifying manually. RuntimeError: Unable to find a valid profile for this image. Try using -v for more details. The reason is that XEN's page tables are funky. XEN uses a technique known as direct mapping which significantly differs from how memory management is done in many other virtualization solutions. "In order to virtualise the memory subsystem all hypervisors introduce an additional level of abstraction between what the guest sees as physical memory (often called pseudo-physical in Xen) and the underlying memory of the machine (machine addresses in Xen). This is usually done through the introduction of a Physical to Machine (P2M) mapping. Typically this would be maintained within the hypervisor and hidden from the guest Operating System through techniques such as the use of Shadow Page Tables." "The Xen paravirtualised MMU model instead requires that the guest be aware of the P2M mapping and be modified such that instead of writing page table entries mapping virtual addresses to the (pseudo-)physical address space it would instead write entries mapping virtual addresses directly to the machine address space by mapping performing the mapping from pseudo physical to machine addresses itself using the P2M as it writes its page tables. This technique is known in Xen as direct paging." What direct mapping means is that instead of having page tables where each entry points to physical memory of the guest, XEN's page tables point to the physical memory of the host. But, why does XEN do this? The answer is performance. Because the guest kernel knows it's virtualized and can cooperate with the hypervisor, XEN can afford cheating in virtualization. Knowing the presence of and cooperating with the hypervisor is one of the strong points of paravirtualization. It requires modification of the guest kernel but provides opportunities for speed improvements. The guest kernel is allowed to know and use the host's physical memory for page table upkeeping. In exchange, it has to perform the upkeep of the page tables in cooperation with the host. This way no heavy translation mechanism like shadow pages tables must be used. However, you can imagine that tinkering with the hosts's memory may allow a hostile kernel to subvert the host. XEN keeps the guest kernel in control because it runs in ring-3 and it is not allowed to directly write into the host memory. Instead, it must issue a hypercall, a call to the hypervisor, whenever it needs to update them. The hypervisor performs sanity checks to make sure the guest kernel request to modify page tables is not attempting to subvert the hypervisor itself or other VMs. 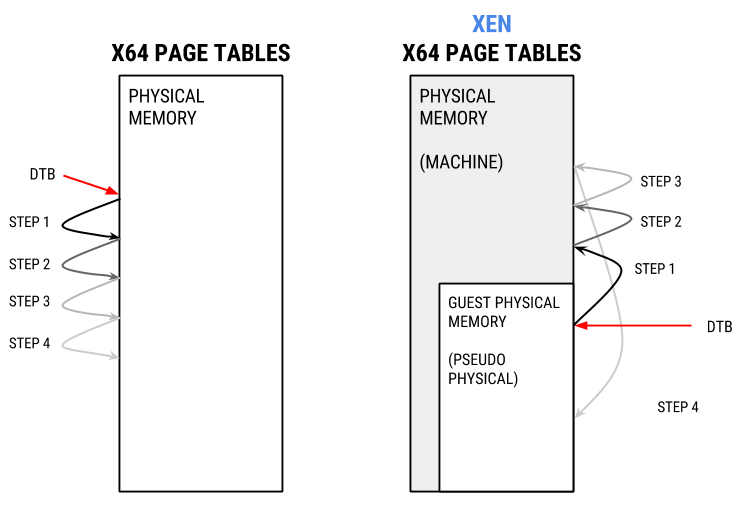 XEN refers to the physical memory of the host as machine memory. The physical memory of the guest is called "pseudo-physical" or simply "physical" memory. To prevent confusion, we'll refer to guest physical memory as (pseudo-)physical. Let's deep dive into direct mapping. We'll compare how the page tables look in AMD64 vs how they look in a XEN guest. The host machine is 64 bits, runs the 3.13 kernel and has 32GB of ram, the guest has 256MB and runs kernel 3.2. All examples will be in the Rekall console. Let's start by using a kernel symbol on a real machine and look how the MMU would translate it. We've picked linux_proc_banner, which is a kernel symbol that points to a format string (%s version %s) for the kernel version. It's a symbol present in all kernels and is what helps build the string in /proc/version. linux_proc_banner is in 0xffffffff81800040 which corresponds to physical address 0x1800040L. vtop shows us that the physical address indeed 0x18000040 as we predicted earlier. And also that each of the different steps of the translation are within physical memory (0x1c1XXXX is around 29M). Note that the value of the pde in this case (0x80000000018001e1) is not an actual physical address. The physical address part of the pde value are only the following bytes 0x80000000018001e1. If we are to inspect this image, DTB validation will most likely fail, but we can do the validation ourselves. In AMD64, the DTB is identified by the symbol init_level4_pgt. As you can see, at the first translation returns a physical address that's not in the physical memory range. 0x28417067 is 6.7GB. Way above 256M. When we try to read from an address so high "pdpte@ 0x153ec19ff0" returns 0. It's not that there's a 0 in that address, it's something Rekall does when the you try to read from an invalid address. 0x28417067 is, in fact, pointing to the host's physical memory. That is, this is a machine address. However, we only have access to (pseudo-)physical memory, the physical memory of the guest. Because the page tables point to the host's physical memory, we can't resolve them directly from the page tables as usual. As was mentioned at the start, XEN maintains a mapping of (Pseudo-)Physical to Machine addresses called a P2M mapping. What we need is a machine to (pseudo-)physical mapping. Or M2P. You can't translate this address back to physical memory via the PAGE_OFFSET method. When analyzing live memory, /dev/pmem only maps physical memory, so we can't ask the kernel to read from this address. Provide a driver that allows reading of virtual addresses. A /dev/vmem of sorts. Use P2M, which we can access, and try inverting it. After all, M2P should be a reverse P2M. Since solution  means we have to compile a new module for every new kernel version and insert it and we like solutions that work universally out of the box, we explored . As explained in arch/x86/xen/p2m.c, p2m_top is essentially a 3-level tree to perform (pseudo-)physical to machine address resolution. Very much like virtual to physical translation works in x86, p2m_top translates (pseudo-)physical addresses to machine addresses. What we're looking for is the reverse: a machine to guest physical translation, or M2P. What this means is that the guest's address range 0 - 0x1000 corresponds to the hosts' 0x7f328000 - 0x7f328FFF range. If we reverse this: that whenever we have a reference to host addresses in the 0x7f328000 - 0x7f328FFF range, we can find them on the guest's physical memory starting at offset 0. So if we ever find a reference in the page tables to 0x7f328000, now we know where to find it. As you can see, we were able to follow the p2m_top tree completely for the first entry. All addresses were within addressable space in the guest kernel memory. And, in fact, if we repeat this for the rest of the tree and invert it we can now resolve all machine to (pseudo-)physical translations. Now, remember the vtop we did earlier? This means machine frame number 0x28417 corresponds to physical frame number 7175 (0x1c07). In plain words, whenever the page tables refer to an address between 0x28417000 and 0x28417FFF we can find its actually backed in the guest's physical memory between 0x1c07000 and 0x1c07FFF. 0x1c07000 is 29MB which is well within the guest's physical memory, as it should. Once we implemented detection of XEN ParaVirtualization and automatic address translation after parsing of the P2M tables, we were able to examine XEN guests transparently from within the guest by just accessing it's (pseudo-) physical memory. Which means this approach also works when doing live analysis. We added initial support for analyzing XEN paravirtualized guests earlier in 2015 and we've been improving and refining it.You can see XEN support in action in our TAP server (xen image). An example: pslist. In this blog post, we've presented the challenges found in analyzing virtual machines running under XEN paravirtualized model. We also discussed two methods to overcome them and how we implemented support for 64bits XEN paravirtualization in Rekall. Over time we've discovered some issues with our approach, specially with later kernels in the 3.X branch that I'll discuss in a follow-up article. Let us know if you've used this functionality with success and want to give us thumbs up or if you've encountered problems, so we can help you solve them. Note that we don't support XEN PV for the 2.6.X branch at the moment.